Everyone has seen Jeff Goldblum in a movie. The Oscar and Emmy-nominated actor has done it all — from alien, dinosaur, superhero blockbusters, to every type of drama and comedy. Outside of having an exciting career, the actor has found a different passion. 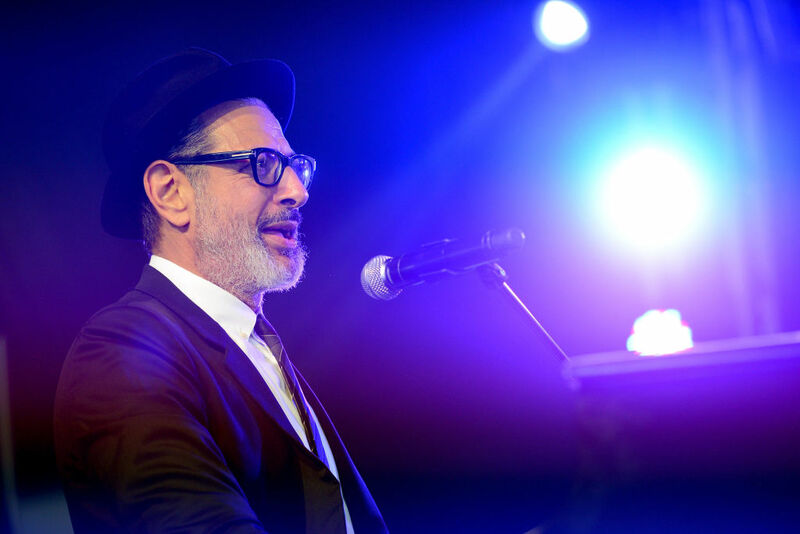 Music has been apart of Goldblum’s life since he was a teenager. 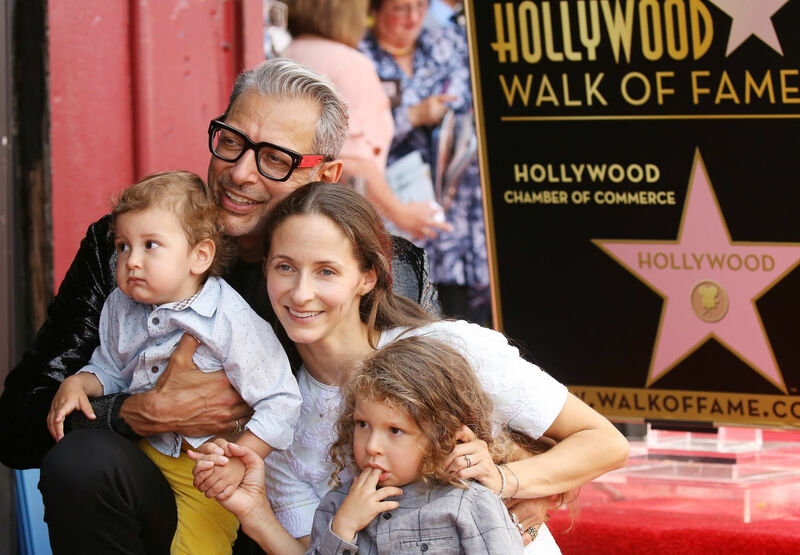 Factor in his regular jazz gig in L.A. and two kids under the age of three and Goldblum would seem to be leading a sleepless life. 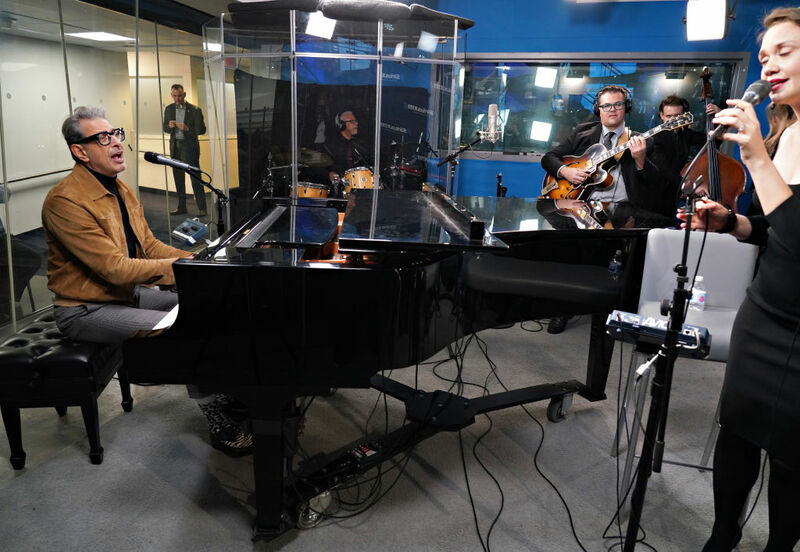 The actor-keyboardist used to bluff his way into playing piano bars as a teen. Now in his sixties, he explains why he recorded his debut album. 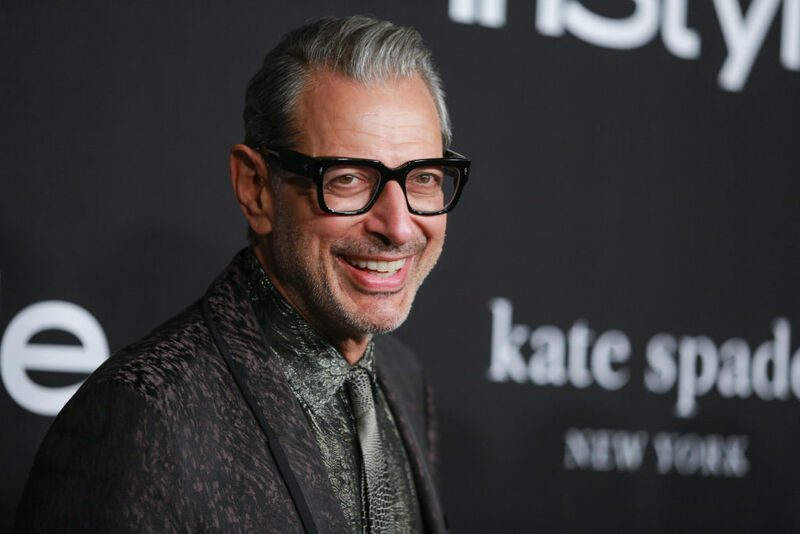 Goldblum was born and raised in West Homestead, a suburb of Pittsburgh. His mother, Shirley Jane, was a radio broadcaster who later ran a kitchen equipment and appliances sales firm. His father, Harold, was a medical doctor. His parents were interested in show business, but their son kept his desires hidden from others. To maintain his motivations, he would write affirmations on his glass shower door. After studying at Carnegie Mellon University, Goldblum moved to New York. The actor told UK television host Graham Norton that he once tried to obtain the company of a prostitute as a thirteen-year-old. “I’d heard about the red light district, so I took five dollars from my dad’s wallet and went there. I walked back and forth for a while and finally went in and picked a girl. On the way to the bedroom, I said, ‘What time is it?’ I looked at my watch and said, ‘I’ve got to go, but I will come back. '” He never did. The actor revealed to Vanity Fair “When I came to California in ’74, I said, ‘I should get a job and get some more money,’ or something like that.” Eventually, the Pittsburgh native found a gig by selling surplus office supplies to correctional facilities. His personality may have been a reason why so many people wanted to work with the actor. Goldblum studied at the Neighborhood Playhouse. Under the guidance of acting coach Sanford Meisner, the young actor made his first performance in a chorus for Two Gentlemen of Verona. But, that wouldn’t be the last of Goldblum’s appearances on the theatrical stage. Goldblum would appear in The Exonerated, The Moony Shapiro Songbook, and Seminar. He’s even performed in plays over in London in The Prisoner of Second Avenue and Speed-the-Plow. A young Goldblum found his first acting credit in Annie Hall. 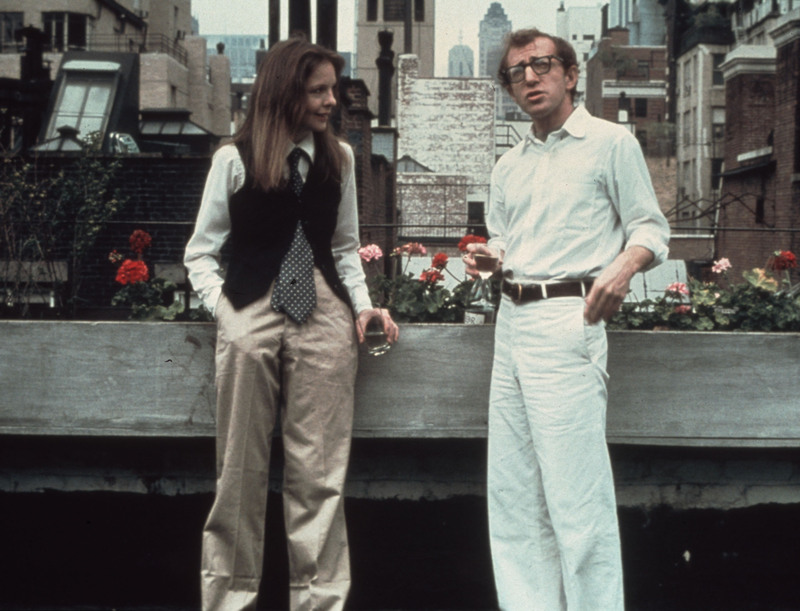 It was a movie directed by Woody Allen, but the comic masterpiece wasn’t a big role for the aspiring actor. Instead, his role in the film only lasted for about six seconds. The only words he speaks are: “I forgot my mantra.” Who is this character? What is the mantra he has forgotten? 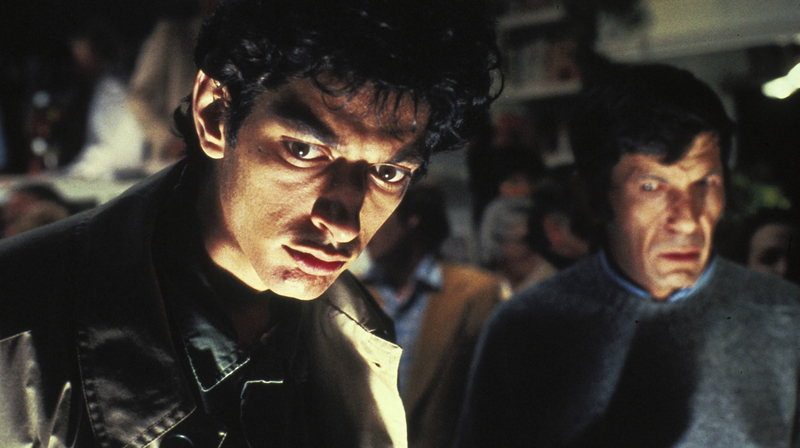 The mystery and enigma that is Jeff Goldblum began early. Goldblum’s personality is enough to impress both writers and directors. It’s impressive to the point where they ask him to play himself on screen. 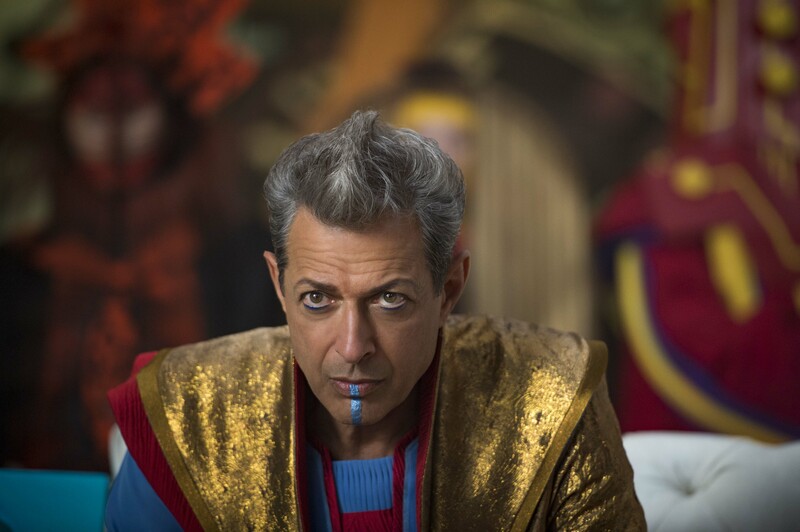 It sounds weird, but in the actor’s case, it’s nothing but a day at the office to him, which is why roles such as the Grandmaster in Thor: Ragnarok were written specifically for him. After his breakthrough role, Goldblum almost landed himself a big accomplishment. It’s no secret that Goldblum is aware of his delivery of dialogue. They’re usually full of “uhs” and notable pauses. The actor believes he knows where that came from — filming a small role in Invasion of the Body Snatchers. 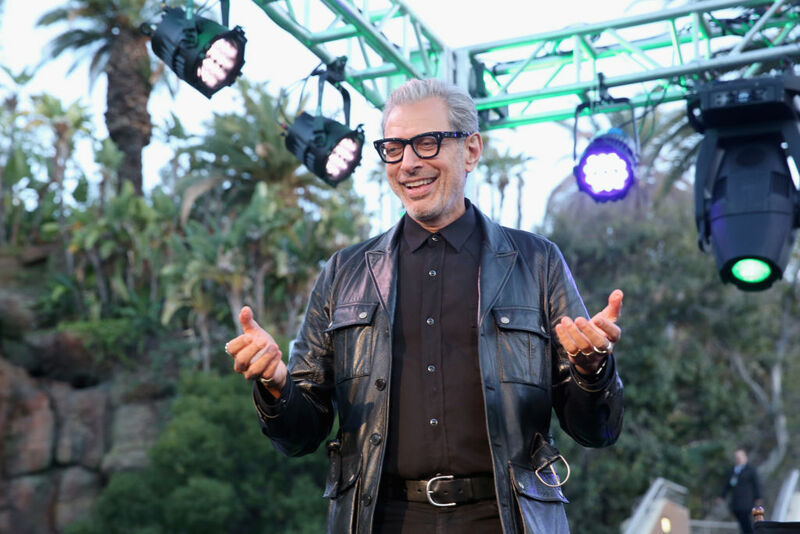 Goldblum recalled a line in the script which came out as“I-I-I-I never thought they would come in … metal ships.” It impressed director Philip Kaufman, and the actor had found his rhythm. The Fly stands as one of the most viscerally-grueling experiences in the horror genre. As Seth Brundle, who has his DNA intermingled with that of an insect, Goldblum articulates a horrifying transformation. However, it was off-camera where the actor faced his own issues. His then-girlfriend, Geena Davis, was cast as Brundle’s love interest. Goldblum had issues watching the actress perform intimate scenes with actor John Getz. 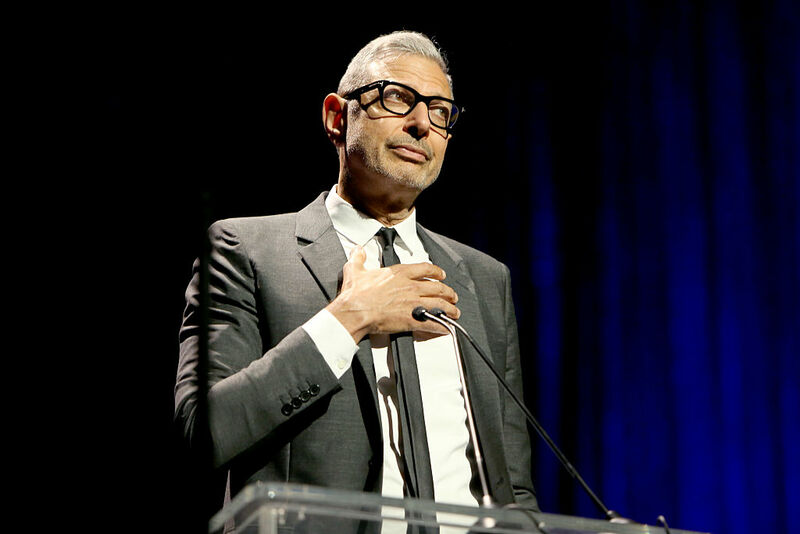 Goldblum was told to leave the set to deal with his issues privately. The Fly didn’t stop Goldblum’s performance as Seth Brundle from being the recipient of an Academy Award. 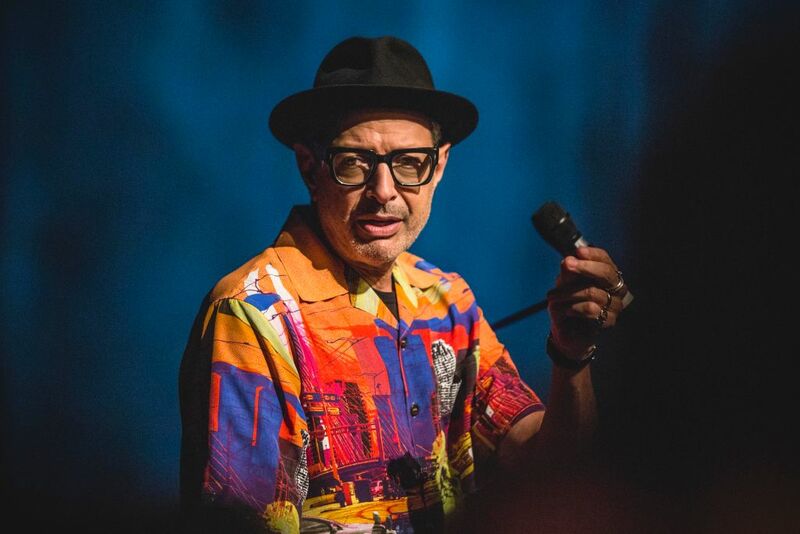 Despite critical raves, it was believed the Academy passed up Goldblum because his performance came in the context of a horror film. London may have a crazy obsession with Goldblum. Read ahead to see what they did. Since many people adore the actor, it’s no surprise that you can now take his acting class! You may not be able to slip entirely into the actor’s distinctive mannerisms, but you can take lessons endorsed by him. The Jurassic Park actor co-founded Playhouse West in Los Angeles with Robert Carnegie in 1981. The experience he gained there would land him another role in The Big Chill. 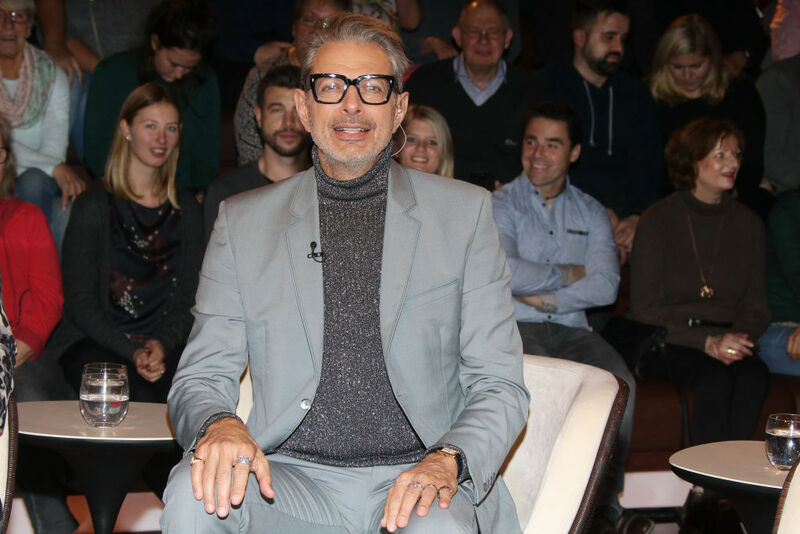 Later on, Goldblum transitioned to teaching classes based on the principles of acting coach Sanford Meisner. The role of Dr. Ian Malcolm in Jurassic Park nearly didn’t happen for Goldblum. Director Steven Spielberg was considering cutting out the character as he considered merging Dr. Alan Grant and Dr. Malcolm, likely as a way to save screen time. The Jaws director arranged a meeting with the actor to advise him on the possible change. 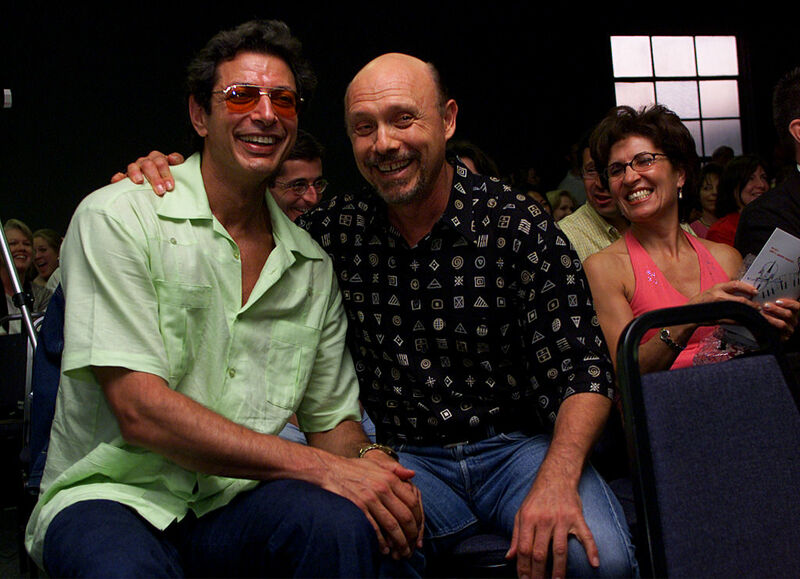 However, it was actually Goldblum’s personality that convinced him to keep Malcolm in the film. Fans may remember the scene in Jurassic Park where an injured Dr. Malcolm is laying down with his shirt open. The pose from that scene, along with the clothing, was recreated for a statue which was erected near London’s Tour Bridge. The 25-foot statue was a tribute to Jurassic Park’s 25-year anniversary in 2018. Plus, the sequel to Jurassic World was being released in the same year as well. Goldblum got a real kick out of this statue. He revealed something really cool during his Reddit AMA. Read ahead to see what it is. Despite not having either now, he was very adventurous back in the day. His parents were smokers, with his mother growing some of her own in her backyard. The actor has also admitted to trying a few other substances a handful of times. However, his forays into that type of fun ended in 1971. Since then, he’s only smoked cannabis a few times but admits he’s sensitive to it and doesn’t like it much. Goldblum has remained remarkably well-preserved for a man who was born in 1952. He credits clean living and a generally balanced diet, though there have been times he went overboard on the latter. He told GQ: “My first wife and I would bring our juicer on planes, and we’d do a carrot cleanse for a week until I’d turn orange and all my poop would be orange.” Yes, sometimes, his poop is occasionally orange. He took some time out of his acting schedule to stop by Reddit to answer the internet’s many questions. One question that stood out the most asked for his favorite dinosaur. Goldblum didn’t get much fashion attention back in the ’90s, but he sure does now. 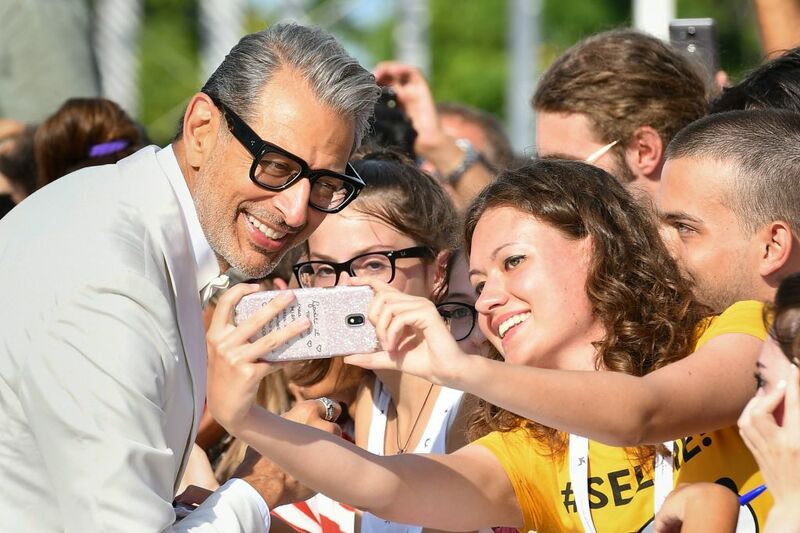 Goldblum inspires a lot of creativity online, which is why the former pencil salesman enjoys curating through Instagram. The obsession for the Independence Day actor is incredible. It’s so big that fans came together to create an epic Facebook page. It’s somewhat of a tribute to the actor, which is why The Same Picture Of Jeff Goldblum Everday page is a must like on Facebook. At any given time of the day, the same picture of the beloved actor is posted on the page for all of its adoring fans to enjoy. 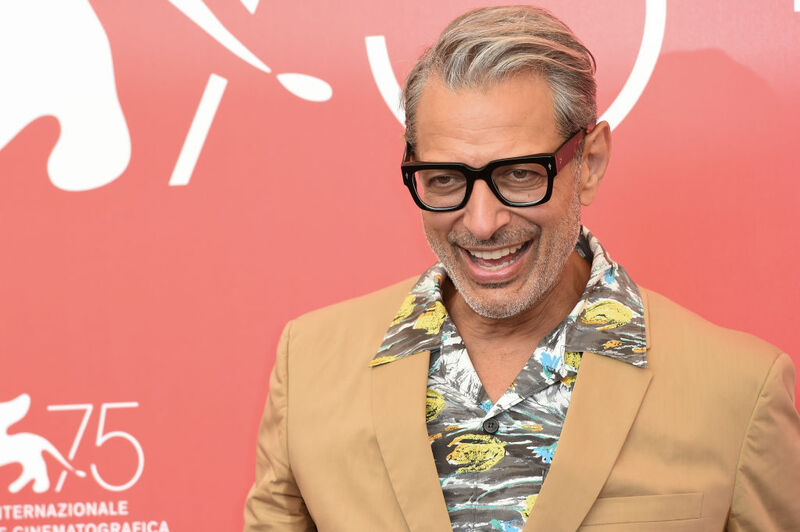 Goldblum didn’t get much fashion attention back in the ’90s, but it appears that his taste only gets better with age. The actor even won InStyle‘s 2018 Man of Style title, furthering his status as a fashion icon. 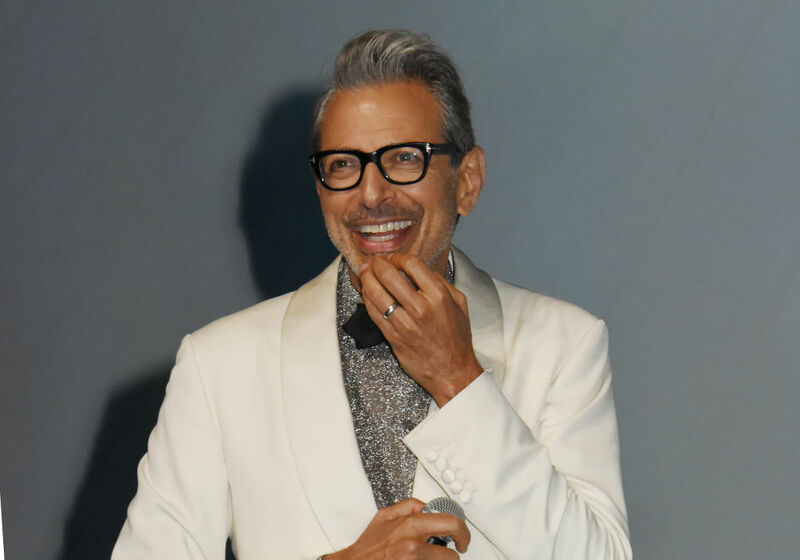 Goldblum credits his style to his wife, Canadian Olympic gymnast Emilie Livingston, who he says has “impeccable taste with what she wears.” The Fly actor also credits the work of stylist Andrew Verroto, who gave him style suggestions. For his love of music, the actor did a secret show at a popular music festival. 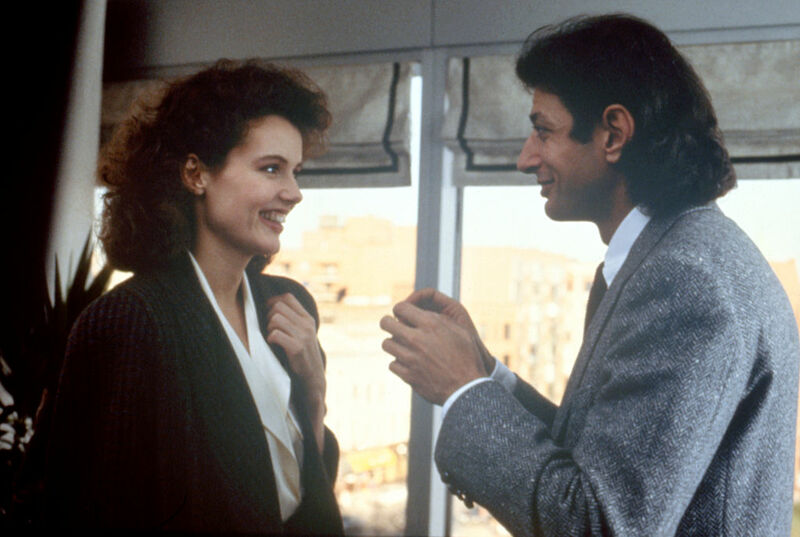 Goldblum was first married to Patricia Paul, and then Geena Davis. In mid-2014, he became engaged to Canadian Olympic gymnast Emilie Livingston. The couple would tie the knot on November 8, 2014. In 2015, The Life Aquatic with Steve Zissou actor revealed a big surprise on the Late Show with David Letterman. He revealed that the couple was expecting a son. Charlie Ocean was born later that summer. In 2017, they welcomed their second child, River Joe. 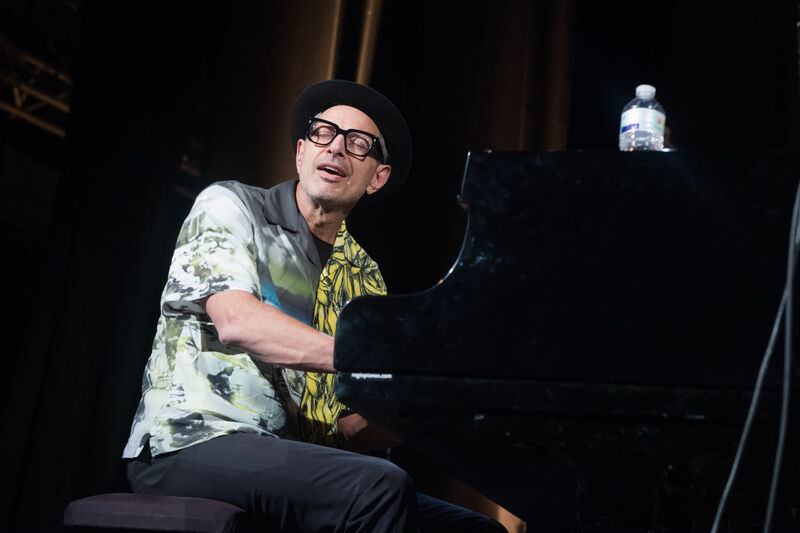 Goldblum is part of an ensemble jazz group, the Mildred Snitzer Orchestra. The group meets at Rockwell Table & Stage on a weekly basis. It’s been said that the actor enjoys mingling with the audience, and chats up customers during these semi-regular gatherings. What’s even better is that the group finally put out an album in 2018. The Capitol Studios Sessions is the debut album from the Cats and Dogs actor. He sat down with Rolling Stone to discuss his love of music and what inspired him to finally make an album. In 2001, attendees of the Coachella music festival in California were surprised. 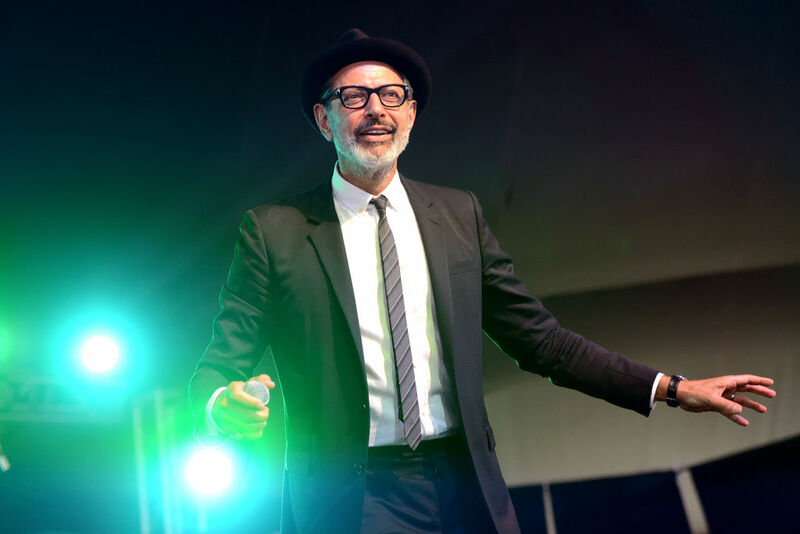 Goldblum would play a low-key, unadvertised jazz set near a campsite. For some reason, he spent the first ten minutes playing Seven Degrees of Jeff Goldblum. Of course, the surprise show threw off many concert-goers, who didn’t realize he was performing until after the festival was over. The set would inspire a hilarious Funny or Die sketch, imaging the set as the most important musical event in history. Read ahead to see whose idea it was to come up with an album. Goldblum’s fascination with the genre started in the mid-nineties. Acting on the advice of jazz enthusiast Woody Allen, the actor, and Peter Walker, began playing standards by musicians like Charlie Parker and Thelonious Monk at various Los Angeles clubs. The director suggested that the duo set up a residency, and while Weller would eventually back out, Goldblum ran with it and stuck to his guns. He wanted to work on music and figure out how to play. Whenever his parent’s friends came over, he would lock himself in a room and open the Yellow Pages to call cocktail lounges. Either his parents would drive him or somehow he connected with a female singer or two who would then drive him to a gig. Goldblum and Peter Weller did The Adventures of Buckaroo Bonsai. The actor played around on the trumpet when the pair would get together at Jeff’s house and play and run through some songs. 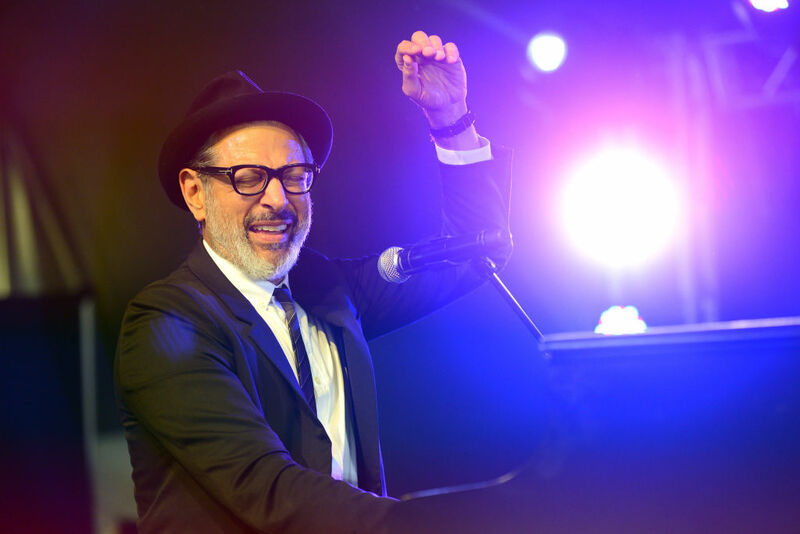 Read ahead to see which producer motivated Goldblum to make an album. 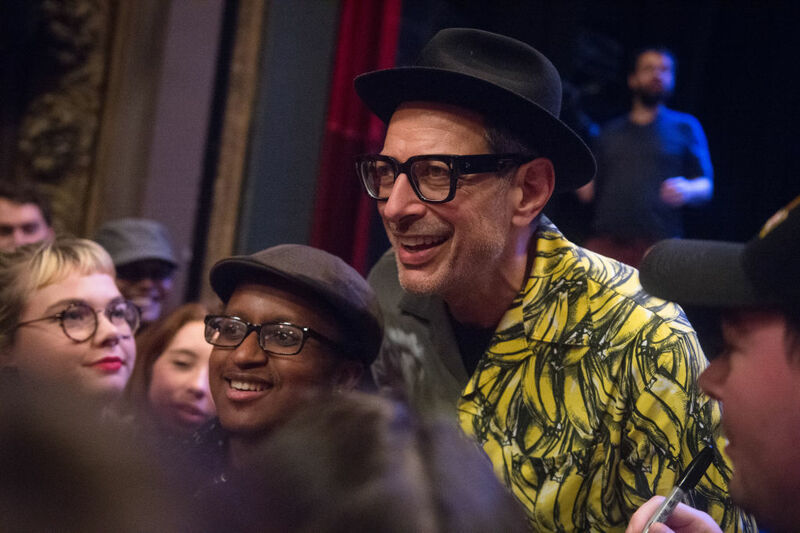 Goldblum enjoys interacting with the audience and hanging out with them. They would start to make it into a show where they knew nothing about what was coming. The group plays spontaneously without any idea of what was on the setlist. Eventually, they started to ramp up the more they played. Playing at the Rockwell started a kind of evolution for the actor. He started to enjoy talking to the audience more and hanging out with them, playing games with them, and encouraging them to figure out what they were going to play. Producer Larry Klein saw the Rockwell show. He said to the actor, “Gee, I think what you guys are doing is a little bit unique. It reminds me of another time when jazz was substantial and progressive.” It was all very spontaneous for the actor-musician. 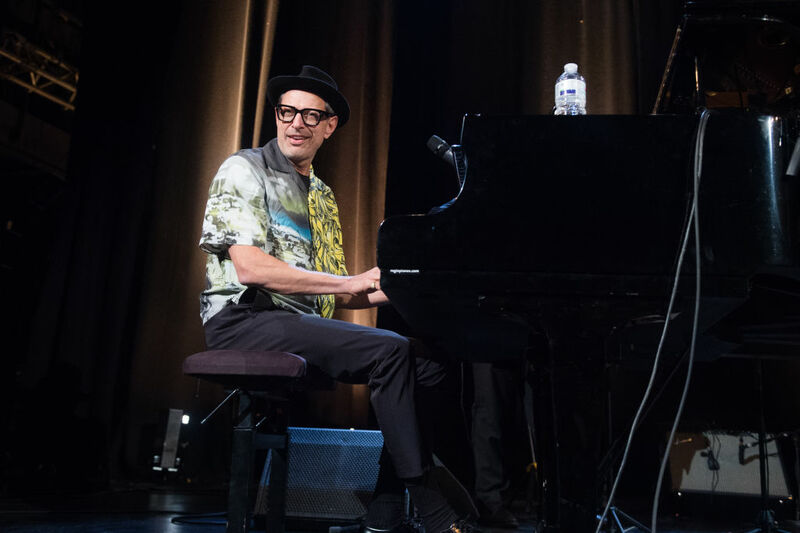 Klein would be on board to help his new jazz star make a studio album.The Capitol Studios Sessions wouldbe released by Decca Records on November 9, 2018. His album did surprisingly well on the Billboard charts. Stay tuned to see where it ranked! It captures the feel and the spirit of the Rockwell. When the group goes to Paris or the London Jazz Festival, they’ll do 45-minute sets. At the Rockwell, Goldblum does something different. “I start talking to the audience with this handheld microphone at 8:30 and I just keep going till 11. I make sure that I’ve peed before and I just keep going.” During the break, the actor meets with the audience to get to know them. Goldblum expressed his desires for both of his passions. He’s trying to express himself more than the actor impresses himself upon anybody he meets. 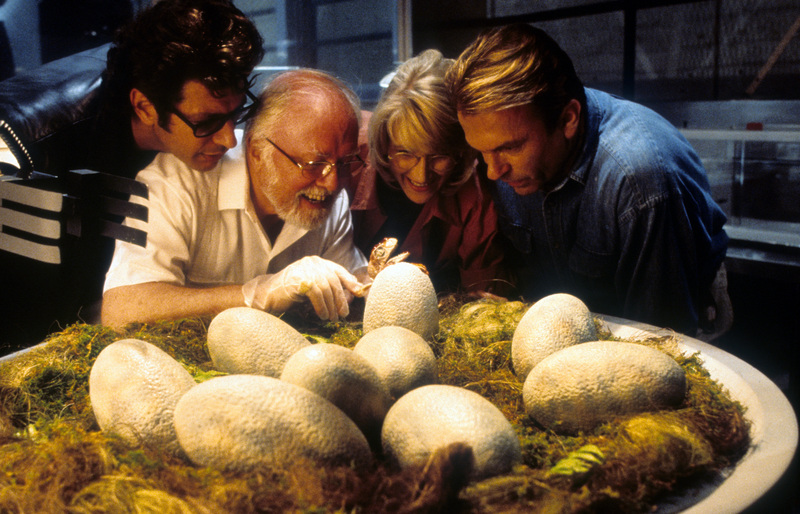 “If you love something, it doesn’t really matter what people think as much because you’re not really relying on that, but I’m gratified to see when people experience the band or come up to me after.” It’s very uplifting for the Jurassic Park actor, and the fans get a kick out of it. Bolstered by guest vocalists Haley Reinhart, Imelda May and Sarah Silverman, alongside trumpeter Till Bronner, the album was a major success. It hit Number One on Billboard’s Jazz Albums chart. “He’s a fantastic jazz pianist, a great bandleader and just about the loveliest man in the world,” said Decca director of A&R, Tom Lewis. 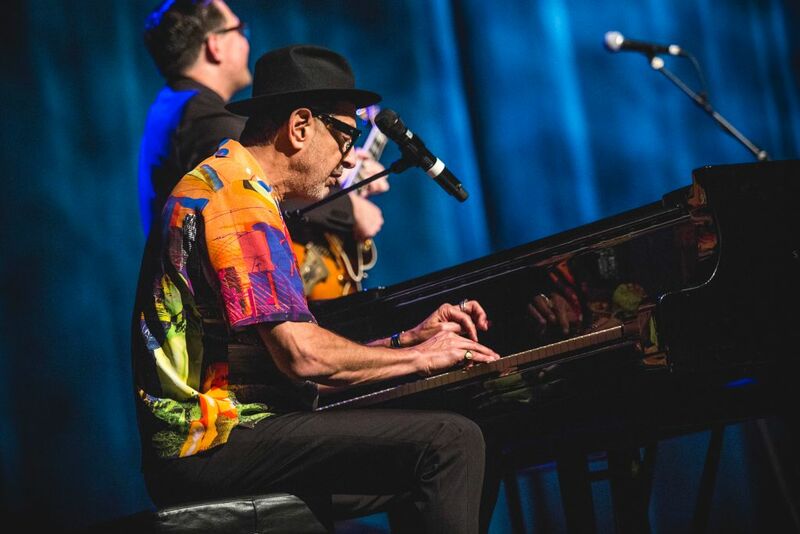 Thanks to the album, Goldblum and the Mildred Snitzer Orchestra concurrently debut at No. 31 on Billboard‘s Emerging Artists list.